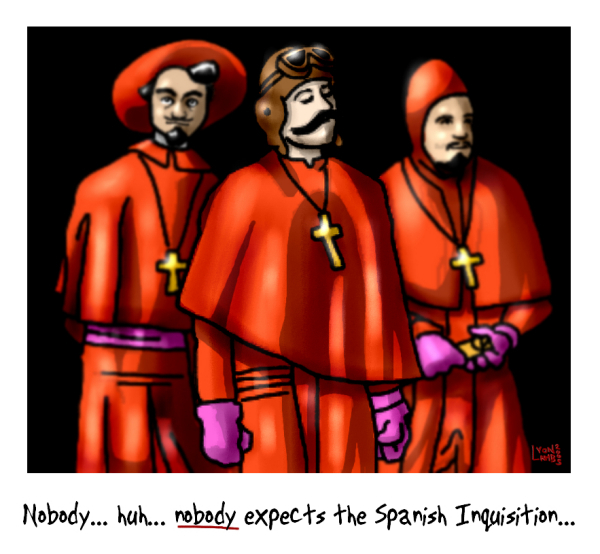 Two weeks ago my husband showed our boys the clip of Monty Python's parody sketch "The Spanish Inquisition." I thought they were going to fall off the couch they were laughing so hard. It was an incredibly enjoyable moment for our entire family. They have begged to see it almost every day since watching it. Will wants to buy red outfits and perform it for his friends. When I was going to sleep that night I was thinking about how much I (and we as humans) need humor. If we are to see the world with realistic eyes it seems to me that this is impossible to handle without humor. I am not articulate enough to expound on this subject but I know it at a gut level that I myself, in order to handle the reality of history and humanity, need to be able to laugh at the absurdity of it all. This skit makes me laugh and ironically, makes me feel hopeful about humanity. I feel so glad to share the joy of humor with my boys. The picture that I used was drawn by Carlos Mal from Hermosillo, Mexico. Hace dos semanas mi esposo mostró a nuestros hijos el clip de la parodia de Monty Python "La Inquisición española". Pensé que iban a caerse del sofá de la risa. Fue un momento increíblemente agradable para toda la familia. Todos pidieron volver a verlo casi todos los días desde que lo vieron. Will se quiere comprar trajes rojos y realizarlo con sus amigos. Cuando me iba a dormir esta noche yo estaba pensando en lo mucho que (y nosotros, como seres humanos) tenemos sentido del humor. Si vamos a ver el mundo con ojos realistas, parece que es imposible manejarlo sin humor. Yo no soy lo suficientemente articulada para hablar sobre este tema pero sé en un nivel visceral que yo misma, con el fin de manejar la realidad de la historia y la humanidad, debo ser capaz de reírme de lo absurdo de todo esto. Esta escena me hace reír e irónicamente me hace sentir optimista sobre la humanidad. Me sentí tan contenta de compartir la alegría del humor con mis hijos. El dibujo que he usado ha sido hecho por Carlos Mal de Hermosillo, Mexico. I love these sketches! Have you shown them the one where they get the "comfy chair" and poke them with the "fluffy pillows"? That's one of my favorites.